Mr. Crab lives FOR Starbucks, but that's a whole other story. I mean, quite literally, we physically live, work, eat and sleep directly above a Starbucks café. Six months ago, we moved into our new flat directly above Starbucks, a legalized drug den offering daily fixes for caffeine-addicted souls like Mr. and Mrs. Crab. From the first time the real estate agent showed us the flat, I knew this would be our home. My biggest fear was that I would end up spending our entire paychecks by living INSIDE the Starbucks, sucking down my drink of choice: Grande Skinny Extra-Hot No-Whip Mochas. It’s taken a lot of willpower to keep that from happening. Living over Starbucks has actually been quite delightful. Every morning at 7a.m., the shop below us comes alive. Our bedroom is directly above the bar portion of the Starbucks. The first sound every morning is the rattling of metal wheels from the trolleys being rolled into Starbucks to deliver the fresh milk. 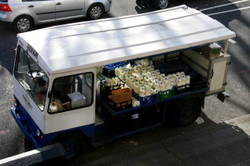 Several milkmen (and yes, we still have milkmen in England) pull up to the front of their store in little, open-sided milk trucks to unload their trolleys, filled with regular low-fat and skim milk, soy milk, juices, muffins, sandwiches. It always takes at least two trucks to fill the shop's inventory. 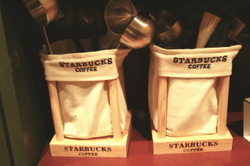 But we can always tell when Starbucks has officially opened for business by a deep muffled, hammer-like sound: “THUMP! THUMP! THUMP!”. It's always three, quick successive thumps, heard throughout the day from morning to close. It took a while until we figured out that the sound was coming from the Baristas, emptying the used espresso grounds from their cappuccino machines by banging the metal filters against the countertop. I usually can sleep through the rolling trolleys, but the thumping always gets me out of bed. On occasion, you can also hear the sweet angelic voices of Ella Fitzgerald or Norah Jones, crooning through the ceiling like a morning wake-up call from heaven, only it's coming from below. And then there’s the smell. Oh, how I love the smell of coffee. We can't smell coffee in the winter. But when the weather is nice and the windows are open, the smell of coffee wafts up into our flat, filling the apartment with the sweet aroma of fresh-ground coffee beans and espresso, with just a hint of chocolate. It beats living above a pub. Or worse, McDonalds. Our little Starbucks is located in north London. 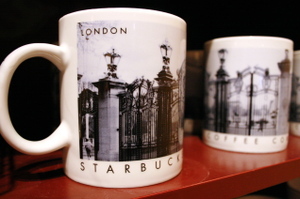 It's one of 7,100+ Starbucks locations around the world, and one of about 500 Starbucks in London. 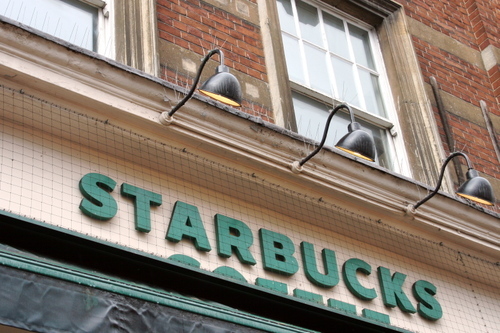 (There are now more Starbucks locations in London than Manhattan!) Our Starbucks is one of FIVE locations within a 10 MINUTE WALK of our apartment. And yes, I’ve been to all five stores. You might think all Starbucks are the same, but I digress. Each has its own unique characteristic and clientèle. 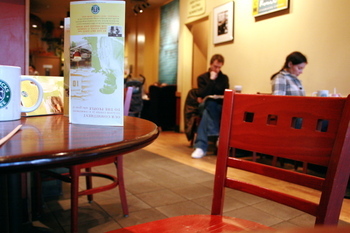 For example, the cafe located inside the Borders bookstore attracts the bookworm crowd. Another Starbucks, which is just a 2-minute walk from ours, attracts an upscale crowd but has the worst service and crappy furniture to boot. The furthest location from us attracts too many unruly teenagers, a few vagrants and beggers. Maybe I'm biased, but the Starbucks below us is perfect. It's like a big extension to our living room. Like Central Perk on "Friends". The clientèle of our Starbucks varies by the time of day. In the early morning hours, most people are taking their coffee to go. Business men in women in suits and dresses, grabbing their coffee on the way to the Angel tube station. 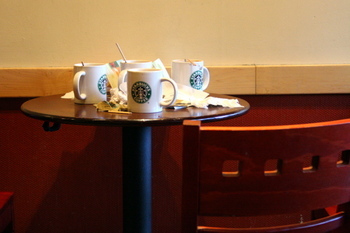 After morning rush hour, the atmosphere changes to the “eat-ins,” the people who are sitting and drinking their coffee inside Starbucks, reading the morning papers. The eat-ins are comprised of two main groups: mummies and others. Mummies are the largest group. In the late morning hours, the mummies take over the back half of Starbucks. There is an invisible line, marked by the bar, that separates the mummies and everyone else. The mummies park their push carriages (strollers) against the back wall by the toilet door and the shelf where the coffee mugs, tumblers and packaged coffee is displayed. On some days, there can be up to a dozen mummies here, sitting in a circle, drinking coffee and discussing celebrity gossip, child-rearing, or some insignificant accomplishment their child made the previous day. The babies normally sit in their baby chairs or their mummy’s laps, sucking on their bottles, thankfully usually quiet. The older kids might drink a Starbucks hot chocolate or juice. Most of the mummies are good about taking their child outside if it starts crying loudly. The front half of Starbucks is occupied by the group I call, “The Others.” I don’t exactly know who the others are, but like me, none of us seem to hold down a regular job or tied down by other time constraints of the real world. Some of the Others are obvious, like the university students who sprawl their textbooks and notebooks, hogging up a table meant for four. Or the gray-haired pensioners (retirees) who gather around chatting about the news and weather. There are a few self-employed folks like me, huddled over a laptop computer and steaming cup of Joe. There are the few folks in suits who meet here for working meetings over coffee. There are the regulars who I see day-in and day-out, like the man in his 30s who comes in everyday around 1pm like clockwork, carrying a gray, medium-sized dog tucked under his arm; the handicapped guy on crutches who everyone pretends not to notice; the old lady who comes in to order tea; the attractive jogger in tight shorts who turns heads when she walks in after her lunchtime run. Around 3pm when the schools let out, the scene again changes with the arrival of the high school-aged kids arriving for their caffine fix. And again at 5pm when workers come home, the well-heeled suited customers return home and stop in for a jolt. 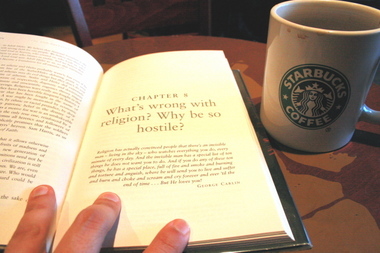 On weekends, the Starbucks scene is completely random. Sometimes the customers are lost American tourists. Or guests attending a show at the convention center around the corner. On Sunday morning, groups of pale-faced, black-clad, “Goths” with spiked hair, leather outfits and giant platform boots lounge at the Starbucks sidewalk patio, nursing their hangovers after a long night of clubbing. Unlike the previously aforementioned bad service Starbucks, our location is staffed by great Baristas. Unfortunately, Starbucks seems to have a revolving door policy of staffing. For a while, the morning shift was run entirely by American expats. Now the regular staff includes a Spanish woman who knows me so well that she has my order ready when I get to the front of the line. I have my own Starbucks ritual. My regular days are Mondays and Fridays. On Monday I come in about 11am to read the Guardian Media weekly. On Fridays, I bring in my laptop to work on writing assignments or blog entries . I always order the same thing: Skinny mocha and a Blueberry or Apple Cinnamon muffin. My favorite is actually the Banana Nut muffin but, for some reason, they've stopped stocking it lately. Our Starbucks is actually two stories. The basement looks more like a living room, with comfy couches, a few chairs, and rotating works of art on the walls. Unfortunately, it's just too dark and dreary down there, so I've never sat there. The two times I've gone down to take a look, it's been completely empty. I always sit upstairs, in the "Others" section in the front-half of the store. I have my favorite table, that has a small wall on one side, and just one table to the right of it, so it's relatively isolated and I don't disturb anyone when I open up my newspapers, especially The Telegraph, which may be physically be the largest newspaper in the known universe. There are also two purple lounge chairs by the window, but I rarely sit there because the door is always propped open, even during chilly rainy weather, which is about 9 months out of the year here in London. When it's nice outside, I head to the outdoor patio. Unfortunately there are only three little tables here, occasionally being hogged up by a few bloody selfish idiots who sprawl their coats and bags on the empty chairs so nobody can sit with them. I don't see why some people are so funny about sitting next to a stranger! Can't we coffee addicts all just get along? Both Crabs readily admit that we are coffee-holics. 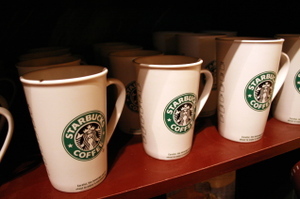 At home, we brew Starbucks ground coffee on our Starbucks-purchased French press, poured into Starbucks mugs and tumblers that we've collected from around the world, listening to Starbucks-produced and marketed music CDs. 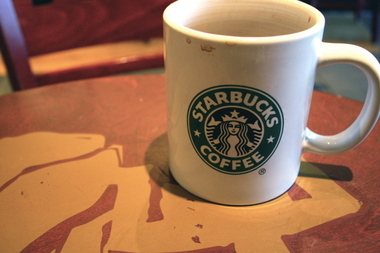 Both Crabs love Starbucks, but Mr. Crab readily admits to being borderline obsessive. But contrary to appearances, we don't actually go to Starbucks that often, mainly because it's downright expensive. When I go downstairs, my usual tab for coffee and muffin comes to £4.24, approximately $8.22. It's about $1 less if you take away instead of eating-in. As pricey as it sounds, the most expensive Starbucks location I've visited was in Kuwait City, where a grande mocha cost about $7; the cheapest was in Des Moines Iowa, where I paid less than $3 for the same drink. I don’t care what the critics say about Starbucks taking over the world. I love Starbucks. I've tried many cafes, both chains and independents. And still have not found a place that makes a mocha or ground coffee as good as Starbucks. I make no apologies for it: I love Starbucks! PS: NO, I do not work for Starbucks, nor do I have any stock investment or other link to the company. I'm just a big fan!